Besides the abundance of spiders sighted in the park that was shared in the post last week, there were obviously many other minibeasts seen as well. The very first picture taken was a motionless, small nettle caterpillar (Family: Limacodidae) taking shelter under a Simpoh Air (Dillenia suffruticosa) leaf. When I returned to the park a week later, I found another 2 separate individuals on the same type of plant. Their appearance looked slightly similar to a more commonly known nettle caterpillar, Darna pallivitta. So far, I had only encountered another type of nettle caterpillar, Setora nitens locally. The second caterpillar encountered was a rather weird looking fellow with several pairs of pointed moles on its back along its body. 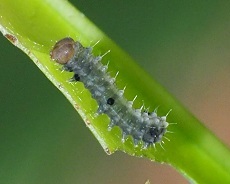 It was feeding on the leaf of Medang (Litsea elliptica). 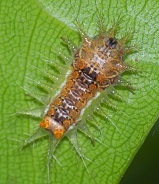 The third caterpillar feeding on a young leaf of Akar Duri (Oxyceros longiflorus) was relatively tiny. I had no idea on their identity at the moment. Moving across to bugs sighted, a mid-size bug (Homoeocerus bipustulatus) with 2 small white dots on its back and green abdomen had been seen more often in my last few visits. The main reason was that the discovery of its second host plant, Common Derris (Derris trifoliata). Its first host plant known to me was Pongam Tree (Millettia pinnata). 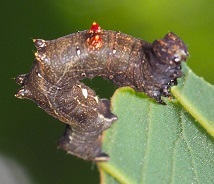 After several sighting of its nymph on the Common Derris, it is quite certain that this is another of its host plant. Equipped with that knowledge, I had started more attention to this mangrove climber. At a location densely intertwined with a climber (Merremia umbellata) and a creeper (Cucumis maderaspatanus), several tiny bugs new to me were found hiding under their leaves. The length of the bug’s antenna was slightly longer than its body length. It was uncertain which one was actually the host plant. A sampling of more minibeasts spotted were shown below. Of the 6 pictures illustrated, I had an identity for 4 of them --- (1) a nymph of a leafhopper (Tartessus ferrugineus), (2) an adult leafhopper (Gyponana species), (3) a Crown Wasp (Megischus insularis) and (4) a nymph of a psyllid (Mesohomotoma species). The continuous search for the identity of the unknown minibeasts is part of the driving force that keep me fixated on this nature venture. I will share a few baby trees observed from this walk in my next post.